"We gather together" is the beginning of one of my favorite hymns. It's about Thanksgiving, which is fast approaching. It's a time for family and friends to enjoy one another's company (hopefully!) and feast on delicious food. It has been described as the easiest holiday, because you don't have to worry about shopping for gifts. Eating is the main focus. For most gatherings, everyone brings a dish -- salad, vegetable, dessert or whatever. The one thing everyone shies away from is cooking the turkey, which is preceived to be the hardest job. I have an easy, fail-proof recipe for cooking the turkey. I am not in any way, shape or form, a cook; so if it's easy for me, anyone can do it. I received it from a friend, finally got up the courage to try it and it worked like a charm. Since then, I have recommended it to many friends, and they now say they wouldn't cook a turkey any other way. Ingredients: turkey, mayonnaise, seasoning salt (and poultry seasoning if desired), wine. The wine can be red or white, cheap, or the cooking wine from the grocery store. The alcohol cooks out, so no worries on that score. And a brown paper grocery sack. Plus a roasting pan, of course. Wash the turkey, unclip the skin from between the drumsticks, remove the neck and giblets from the cavities. Heavily sprinkle seasonings all over the turkey. With a spatula, "ice" the turkey with the mayonnaise. Spread generously over all exposed surfaces. Putting your hand inside the turkey, place it inside the paper sack and the paper sack into the roasting pan. Fill the cavity with the wine until it reaches the spill-over point. Crimp the paper sack close. Roast in a 350 degree oven the required time. About 30 minutes before it is supposed to be done, I gently tear the paper sack away and let it brown a little more. That's it. Set it and forget it . You don't have to baste or watch it. The mayonnaise cooks in from the outside and the wine evaporates out from the inside, giving you a really moist delicious turkey. And remember, when you're getting ready or cleaning up, for those things you use only once a year, the smartest idea is to store them so they are out of their way. 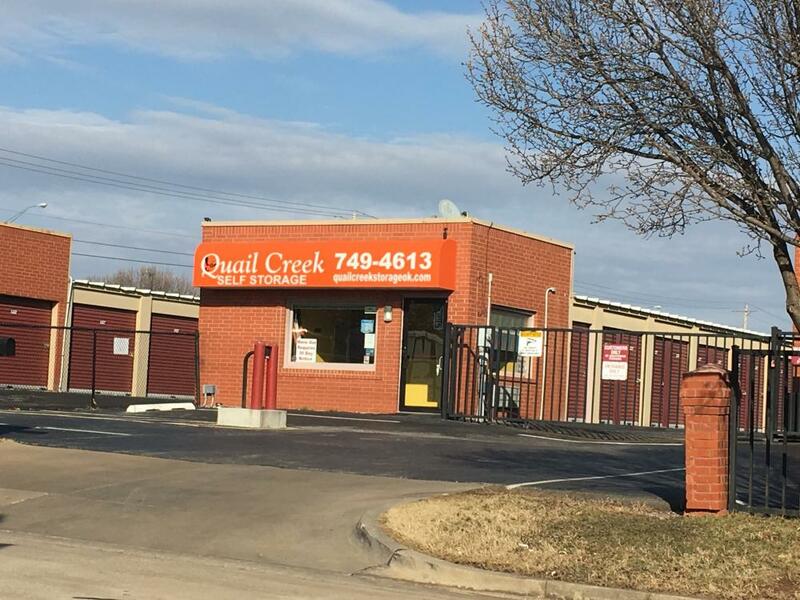 Quail Creek Self Storage is the perfect solution. We have units as small as 5 x 10, so they are perfect for out-of-season decorations or rarely-used items. We are conveniently located at 3030 West Memorial, on the south side, just west of the Shoppes at Quail Springs shopping center. You can access us from Hollow Rock Road in the Quail Creek neighborhood and not have to fight the Memorial Road traffic. We are open Monday through Friday 9:30-5:30 and Saturday from 10:00-2:00, or we will meet you by appointment. Our phone number is 749-4613, and our manager will be happy to help you. You have 24/7 access to your storage, and we have security lights and cameras for your security.